Hurricane Michael is not expected to score a direct hit on Mobile Bay, relieving concern that the coal ash basin at Alabama Power Company’s Plant Barry could be threatened, according to Cade Kistler, program director for Mobile Baykeeper, an environmental organization. 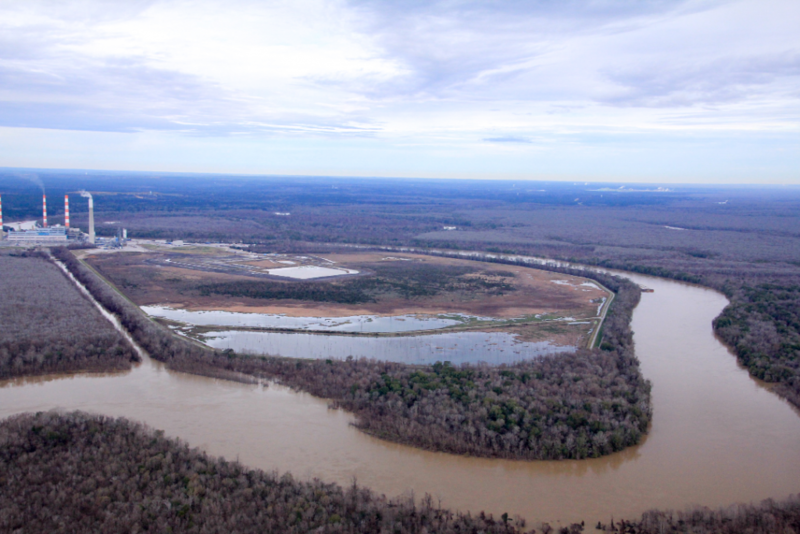 Kistler and Casi Callaway, Mobile Baykeeper’s executive director, citing a report issued by Baykeeper, earlier raised questions about a hurricane’s effect on safety of the coal ash storage basin. Alabama Power spokesman Michael Sznajderman said in an email that the company is prepared for the storm. The coal ash stored next to Plant Barry is virtually surrounded by the Mobile River 25 miles upstream from where it enters the bay. Baykeeper officials say they worry that the earthen dams holding back the river could be breached. Forecasts late Tuesday projected the hurricane to reach land Wednesday evening, possibly as a Category 3 or 4 hurricane. The storm is projected to make landfall to the east of the bay, with the major damage expected to be in the Florida Panhandle near Panama City, according to the National Weather Service. Areas to the east of Michael’s landfall are expected to have minimal effect on Mobile Bay and Mobile River, with clearing weather within the next couple of days. Plant Barry is surrounded by ecologically vulnerable wetlands of the Mobile-Tensaw Delta, sometimes called “Alabama’s Amazon” because of its size and diversity of plant and wildlife. In addition, the power generation plant is a mile from the secondary drinking water supply for 250,000 people. Alabama Power has said it is in the process of drying the slurries of coal ash at its power plants to reduce their size, consolidating the toxic material in the middle of the basins, and capping them in place. Baykeeper and other environmental groups have said they prefer the company dewater, excavate and move the coal ash to an off-river landfill with an underlining as well as a cap, to keep rainwater from entering at the top and leaching out through the bottom. That, Kistler said, would keep Alabama from being the next coal ash disaster. “In 2013 the Riverkeepers in North Carolina urged Duke Energy to dry and move its coal ash from along the rivers. Duke didn’t agree and kept the ash on the riversides,” he said. After the recent Hurricane Florence, he said, the Cape Fear River was contaminated by outflow of coal ash from a power plant near Wilmington. Florence was a slow-moving, rain-heavy weather event that created massive flooding throughout the Carolinas. Kistler said models of Hurricane Michael show it is fast-moving and expected to move quickly from the coast through southeast Alabama and into Georgia and the Carolinas with minimal impact on Mobile Bay unless the storm changes track as it nears the Gulf Coast. Kistler said climate change and warming of the planet point to the possibility of more frequent storms and the need to be prepared for major flooding in coastal areas and along Alabama’s large river system. This week, the International Panel on Climate Change meeting in South Korea released a new survey of climate-change impacts the world is already experiencing with one degree of warming. It warned of the severity of future impacts with an additional 0.5 degrees of warming, when it said 10 million more people could experience permanent flooding. Alabama Power customers can access information about preparing for a hurricane or severe weather here.